whimsical, fun website providing "Wonders of the Day" such as "Do Rabbits Have Good Eyesight?" to "When is Technology Old?" A vocabulary list provides a learning base for each lesson. Related questions will spark students' curiosity and motivate them to learn more about the topic. The "Wonderize It" tool lets teachers customize a lesson based on a daily "Wonder" question. The engaging informational text can be used to address Common Core Standards in reading while incorporating related images and videos. Grades K - 12.
about world news, science and technology, society and arts, movies, and books. School-age children are encouraged to respond to the content and may submit articles, short stories and book reviews. All content is reviewed by Youngzine’s editors and updated every two weeks. Grades K-8. We have an amazing class! We have three room moms this year! They are Staci Young, Tricia Darby, and Livia Johnson. Thank you so much for volunteering!! 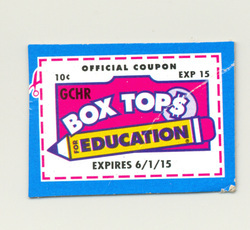 Please send in Box Tops for Education anytime. We have a Box Tops collection box in our classroom. The homeroom that collects the most wins a party!